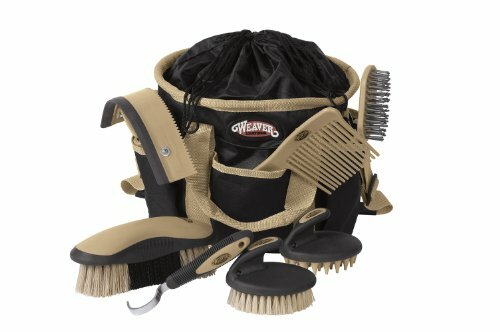 What Is The Best Horse Grooming Kit On The Market In 2019? What Is The Best Horse Grooming Kit On The Market? If you’re anything like a huge proportion of the horsey world, you have loads of brushes lying around that you have picked up or been given, a million and one hoofpicks in several different places (if only you could remember where they were when you wanted one!) and various other bits and bobs of grooming kit all over the place. Wouldn’t it be nice though to have a proper grooming kit with everything you need, all in one place? No doubt you have looked at grooming kits online, and you may find yourself a bit spoilt for choice – which one to get? This comprehensive kit contains everything you need to get your horse looking spick and span. With all the usual suspects – dandy brush, body brush, finishing brush, curry comb, mane and tail brush and comb and hoof pick, you will have everything you need right at your fingertips in this handy carry bag. Secure grip handles – Made from control-touch rubber, the handles of these brushes are easy to keep hold of and comfortable in the hand. Easy to transport – The kit comes in a great, compartmentalised carry bag which makes it easy to take it to shows and camping trips, and keeps everything in the right place. Great as a gift or a start-up kit – This set is ideal as a present for a horse lover or for a really good first kit if it’s yourself you are looking to buy a present for. Durable for long-term use – This is not a kit for a season or even just for a year; it will keep going and going due to its hardy design. Lack of color options – If you want to have everything matching, and your color isn’t blue, this may not be the kit for you as blue is the only color it comes in. This is a fantastic grooming kit for someone who is just starting out, or who wants to take a grooming kit away with them, or someone who wants to keep everything all together in one place. It’s pretty much perfect for any horse owner, as it contains everything you need for a thorough grooming, and it is compact and easy to transport. 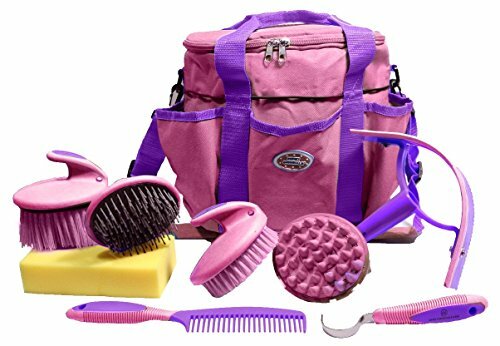 This is a great grooming kit for people who are new to the riding scene, or youngsters, because of the great color options and the way the brushes fit easily in the hand. It’s a comprehensive kit, containing a hoof pick, a mane and tail comb, a soft curry, two hard backed brushes with varying bristle lengths, a sweat scraper and a bathing sponge. These tools all come in a convenient carry bag with a padded shoulder strap for easy carrying. Great quality kit – These are good, hardwearing brushes which will last and last through seasons of camps, pony clubs and general day to day use. Brilliant colors! – For someone who wants a set to match their riding colors, or even just one that will stand out at the yard, this is the set for you. Extra storage pockets – With handy added pockets for storing treats, a phone, or other bits and pieces, the bag that comes with this set is really handy. Good value for money – This is a quality, durable kit that won’t cost the earth, so it’s perfect for those on a budget who need a good grooming kit. May not be the highest quality – It has been suggested that this kit is more suitable to beginners, children or part time riders. If you are looking for a kit that has everything, for a decent price, then this is a really good option. Particularly if you are buying the kit for kids, or if you yourself like really bright colors, then this is the one to go for. There are three color choices to choose from, and all of them contain the same quality brushes. A high quality grooming kit that contains everything you need – a face brush, a coarse curry, a sweat scraper, a mane and tail brush, a comb, a dandy brush and a hoof pick. These brushes are ergonomically shaped to fit comfortably in the hand, and make grooming a fun and pleasant experience for all involved. Great tote bag for easy transport – The brushes all come with their own carry bag, making it easy to store them after use and ensure you don’t lose any brushes. Variety of color options – Making it easier to spot your items at shows, camps, or in the tack room, having color coded brushes can make life easier. Extra pockets for extra storage – The bag has added pockets on the outside in which you can carry other brushes, or treats or a camera to capture those exciting moments. Padded shoulder strap for comfort – Just what you need if you’re going to be carrying your grooming kit for any distance. The padded shoulder strap prevents fatigue on the shoulders and back. The hoof pick lets the kit down – Some users have commented that the hoof pick doesn’t have bristles as standard, and some have even claimed that it doesn’t stand up to hard use and broke quickly. A good quality kit for those who are looking for a hard wearing grooming kit that can be easily transported, and has extra pocket for carrying around those added bits that you never knew you needed! A good grooming kit is a rider’s best friend. Grooming is not only functional part of horse care, to keep your best friend looking, well, their best, but it’s also an amazing bonding exercise. There is very little in life that is nicer than brushing a horse, watching their coat and their eyes shine as they enjoy that contact with you and you with them. Therefore, a good grooming kit is a really essential piece of kit. 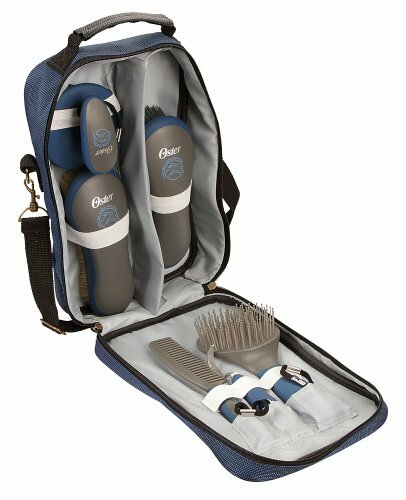 For a comprehensive, well stocked kit bag, choose the Oster Equine Care 7 Piece Equine Grooming Kit. If you want a little more color in your grooming kit, go for the Darby Premium Comfort 9 Piece Grooming Kit. If you need a good quality kit in a bag with extra pockets, try the Weaver Leather Grooming Kit. Put it this way. Give me one that has all that I need for a typical grooming job and it can all be stored in one place and I am sold! All 3 of these horse grooming products seem to do just that. Major bonus!